Finally, the first budget domestic residential elevators on the market! 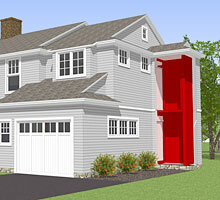 Now you can enjoy the benefits of having efficient vertical access in your own home. Hoyt Residential Elevators are designed for new construction, retrofits, apartments, condominiums, elderly and handicap accessibility. Look to your family's future. The stairs that make your living space so convenient today may eventually become an impediment tomorrow. Why be forced to relocate when, for the price of a bulky handicap access ramp, you can have a safe, smooth-operating, multi-level home elevator installed quickly, cleanly and professionally? Unlike other residential or home lifts, Hoyt Residential Elevators are designed for your home from the ground up, rather than re-configured from commercial construction applications. Elevators may be inexpensively installed directly onto the 1st floor or basement slab with no need for an expensive pit. The entire unit fits within the confines of a simply framed shaft and needs only 98" headroom above upper level. Flexible entrance configurations and a low profile floor make for virtually unlimited horizontal and vertical access. Choose from interior or exterior mount residential elevator designs. Hoyt Elevator is the only manufacturer of residential elevators in New England. Accessibility For New England is the Hoyt residential & home elevator authorized intallers for NH, ME, & VT. Contact us for a free consultation and for a price quote on your residetial elevator installation.